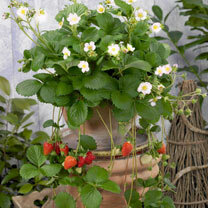 Heavy cropping and deliciously flavoursome with a vitamin C content up to 50% higher than other everbearing strawberries. Easy to grow and maintain, just keep them well fed and watered and you'll be rewarded with a constant supply of lush, sweet fruit from June to October. Height 21-30cm (8-12"); spread 30-40cm (12-16"). Supplied in a 9cm pot.